, K. B. a British officer of great bravery and talents, was the son of George Abercrombie > of Tillibodie, in Clackmannanshire, esq. by Mary daughter of Ralph Dundas, of Manour, esq. and was born about the year 1738, or, according to his epitaph at Malta, 1733; and, after a liberal education, went by choice into the army. His first commission was that of cornet in the third regiment of dragoon guards, dated March 23, 1756. In the month of February 1760, he obtained a lieutenancy in the same regiment, and in that of April, a company in the third regiment of horse. In this last regiment he rose to the rank of major and lieutenant-colonel. 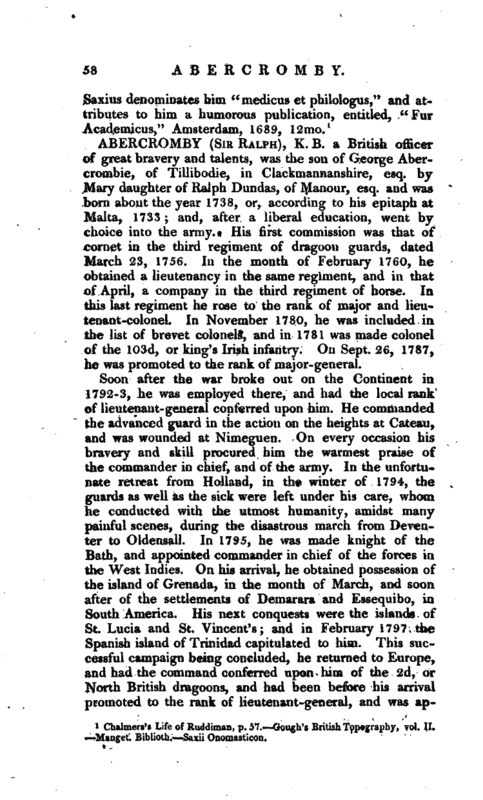 In November 1780, he was included in the list of brevet colonels, and -in 1781 was made colonel of the 103d, or king’s Irish infantry. On Sept. 26, 1787, he was promoted to the rank of major-general. Soon after the war broke out on the Continent in 1792-3, he was employed there, and had the local rank of lieutenant-general conferred upon him. He commanded the advanced guard in the action on the heights at Gateau, and was wounded at Nimeguen. On every occasion his bravery and skill procured him the warmest praise of the commander in chief, and of the army. In the unfortunate retreat from Holland, in the winter of 1794, the guards as well as the sick were left under his care, whom he conducted with the utmost humanity, amidst many painful scenes, during the disastrous march from Deventer to Oldensall. In 1795, he was made knight of the Bath, and appointed commander in chief of the forces in the West Indies. On his arrival, he obtained possession of the island of Grenada, in the month of March, and soon after of the settlements of Demarara and Essequibo, in South America. His next conquests were the islands of St. Lucia and St. Vincent’s; and in February 1797 the Spanish island of Trinidad capitulated to him. This successful campaign being concluded, he returned to Europe, and had the command conferred upon him of the 2d, or North British dragoons, and had been before his arrival promoted to the rank of lieutenant-general, and was | appointed lieutenant-governor of the Isle of Wight, from which he was in 1798 removed to the higher office of governor of Fort Augustus and Fort St. George. Previous to this he was appointed commander in chief in Ireland. In this situation he laboured to maintain the discipline of the army, to suppress the rising rebellion, which had been concerted between the French government and a number of traitors at home; and he protected the people from the inconveniencies of military government, with a care and skill worthy of the great general, and the enlightened and beneficent statesman. But circumstances rendering it necessary that the civil and military command of that country should be invested in the same person (the marquis Cornwallis), he was removed to the chief command in Scotland, where his conduct gave universal satisfaction. When the great, and, in its plan, highly judicious enterprize against Holland was undertaken, sir Ralph Abercromby held a principal command under his royal highness the duke of York; and it was confessed, even by the enemy, that no victory could have conferred more honour than the great talents, activity, and bravery he displayed in forwarding the purposes of that expedition, which failed, partly from the want of a judicious co-operation on the part of our allies, the Russians, but perhaps chiefly from the conduct of the Dutch themselves, who still were deluded by the professions and pretended amity of the French. A more favourable enterprize, however, soon afforded our gallant hero an opportunity of immortalizing his name. 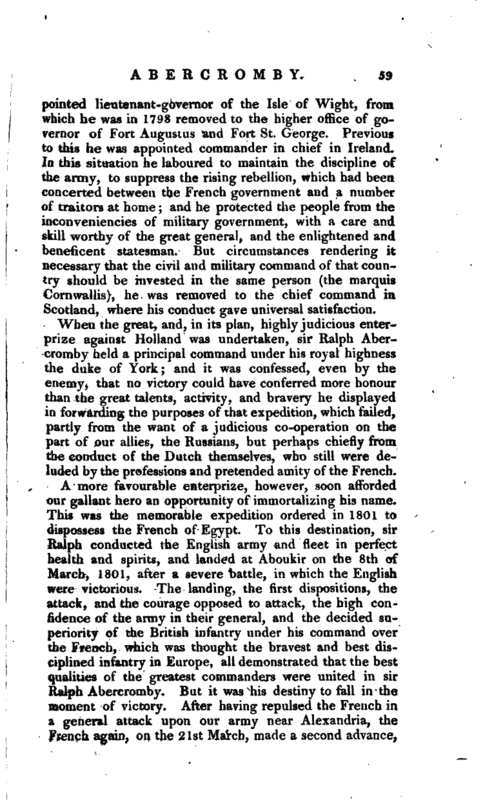 This was the memorable expedition ordered in 1801 to dispossess the French of Egypt. To this destination, sir Ralph conducted the English -army and fleet in perfect health and spirits, and landed at Aboukir on the 8th of March, 1801, after a severe battle, in which the English were victorious. The landing, the first dispositions, the attack, and the courage opposed to attack, the high confidence of the army in their general, and the decided superiority of the British infantry under his command over the French, which was thought the bravest and best disciplined infantry in Europe, all demonstrated that the best qualities of the greatest commanders were united in sir Ralph Abercromby. But it was his destiny to fall in the moment of victory. After having repulsed the French in a general attack upon our army near Alexandria, the French again, on the 21st March, made a second advance, | which was contested with unusual obstinacy, and they were again forced to retreat. On this memorable occasion, he received a mortal wound in the thigh, which he concealed until the enemy were totally routed, when he fell from his horse through loss of blood. He was conveyed from the field of battle on board the admiral’s ship, where he died on the 28th, and was interred under the castle of St. Elmo, in La Valetta, in the island of Malta. 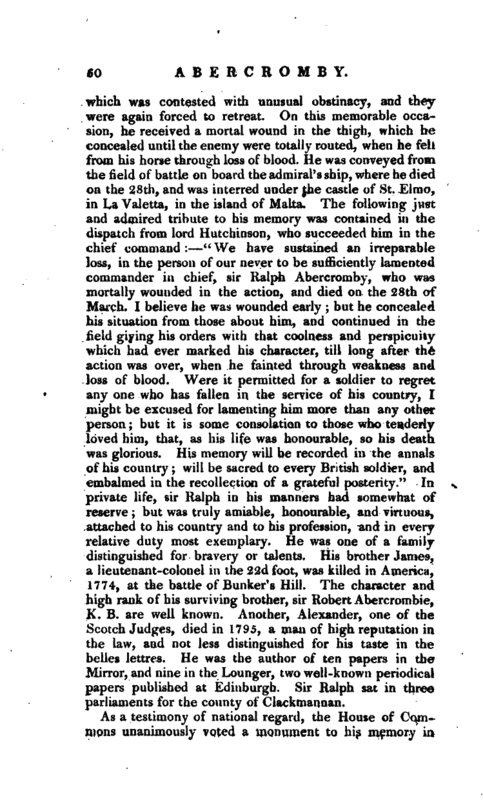 The following just and admired tribute to his memory was contained in the dispatch from lord Hutchinson, who succeeded him in the chief command:——“We have sustained an irreparable loss, in the person of our never to be sufficiently lamented commander in chief, sir Ralph Abercromby, who was mortally wounded in the action, and died on the 28th of March, I believe he was wounded early; but he concealed his situation from those about him, and continued in the field giving his orders with that coolness and perspicuity which had ever marked his character, till long after the action was over, when he fainted through weakness and loss of blood. Were it permitted for a soldier to regret any one who has fallen in the service of his country, I might be excused for lamenting him more than any other person; but it is some consolation to those who tenderly loved him, that, as his life was honourable, so his death was glorious; His memory will be recorded in the annals of his country; will be sacred to every British soldier, and embalmed in the recollection of a grateful posterity.” In private life, sir Ralph in his manners had somewhat of reserve; but was truly amiable, honourable, and virtuous, attached to his country and to his profession, and in every relative duty most exemplary. He was one of a family distinguished for bravery or talents. His brother James, a lieutenant-colonel in the 22d foot, was killed in America, 1774, at the battle of Bunker’s Hill. The character and high rank of his surviving brother, sir Robert Abercrombie, K. B. are well known. Another, Alexander, one of the Scotch Judges, died in 1795, a man of high reputation in the law, and not less distinguished for his taste in the belles lettres. He was the author of ten papers in the Mirror, and nine in the Lounger, two well-known periodical papers published at Edinburgh. Sir Ralph sat in three parliaments for the county of Clackmannan. Gent. Mag. 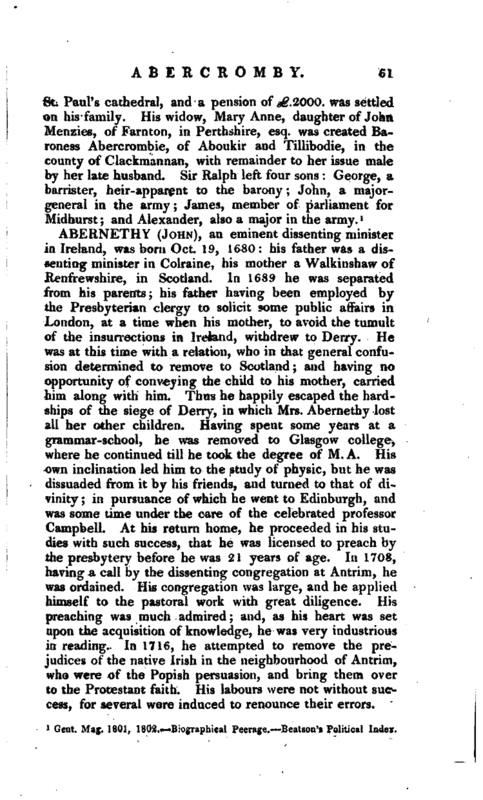 1801, 1802.—Biographical Peerage.—Beatson’s Political Index.